"Democrats favored the formal European approach while Republicans opted for the picturesque English style." from a discussion of the highly politicized process of selecting a design for Central Park, as described in Witold Rybczynski's "A Clearing In The Distance: Frederick Law Olmsted and America in the 19th Century". "The six Republicans, together with the reform Democrat Andrew Green, all cast their votes for the same project: Greensward. Vaux and Olmsted had won." 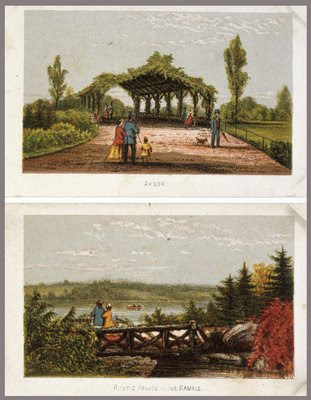 Incredible postcards of Central Park. Imagine seeing it without its nest of skyscrapers. Interesting about the political differences in preference for a type of garden style. If asked to guess I think I would have picked the opposite.